SpaceX performed a static-fire test of a Falcon 9 rocket at Kennedy Space Center in Florida on May 28, 2017, keeping the booster on track to launch the company’s Dragon cargo capsule toward the International Space Station on June 1. The test also ignited a small wildfire at neighboring Merritt Island National Wildlife Refuge. SpaceX got a little more fire than it bargained for when it tested a Falcon 9 rocket over the weekend. 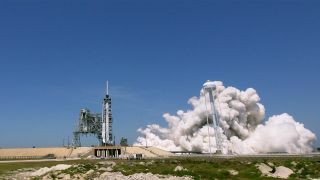 The two-stage Falcon 9 behaved just fine during the standard "static fire" test at NASA's Kennedy Space Center (KSC) in Florida on Sunday (May 28) — but a small chunk of neighboring Merritt Island National Wildlife Refuge blazed up as a result. Firefighters with the U.S. Fish and Wildlife Service (USFWS) quickly got the fire under control by repeatedly drenching it with water dropped from a helicopter. The wildfire topped out at a mere 4 acres (1.6 hectares), USFWS officials said via Twitter Sunday. Firefighters dump water on a small wildfire at Florida’s Merritt Island National Wildlife Refuge ignited by a SpaceX rocket test at neighboring Kennedy Space Center. The fire was quickly contained, U.S. Fish and Wildlife Service officials said. The pre-flown craft is SpaceX's robotic Dragon cargo capsule, which will carry lots of scientific experiments, hardware, food and other supplies up to the International Space Station (ISS). This particular Dragon has already flown to the ISS once before, in September 2014. SpaceX also aims to land the Falcon 9's first stage back on Earth during Thursday's launch, which is scheduled to take place at 5:55 p.m. EDT (2155 GMT). You can watch all the action live here at Space.com when the time comes. If all goes according to plan, Dragon will arrive at the ISS on Sunday (June 4). The capsule will stay attached to the orbiting lab for nearly a month, returning to Earth for a soft, ocean splashdown on July 2. SpaceX's rocket-landing activities are part of the company's attempt to develop fully and rapidly reusable launch systems, a breakthrough that company founder and CEO Elon Musk has said will revolutionize spaceflight. To date, SpaceX has landed Falcon 9 first stages on 10 separate occasions. The company has re-flown one of these landed boosters; that milestone occurred on March 30, during the successful launch of the SES-10 communications satellite. Editor's Note: A previous version of this story incorrectly stated that no pre-flown spacecraft has launched since 2011. The Air Force's reusable X-37B space plane has completed several missions since then.